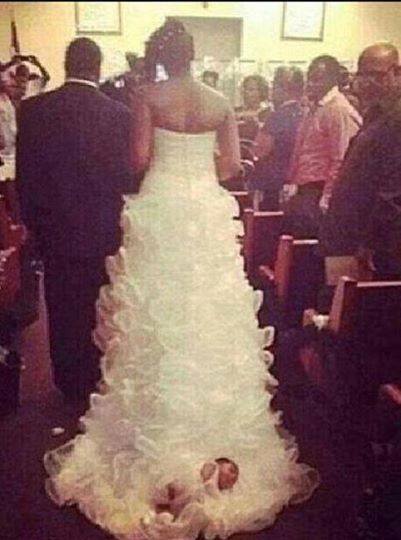 What is Wrong with this Baby in Wedding Gown Photo? What is Wrong with this Baby in Gown Wedding Photo? I don’t even know what to say about this. Like, what ever happened to just buying a cute baby carriage with wheels and putting the baby there? I do not get this at all. The bride, a Tennessee based woman named Shona Carter-Brooks said “her infant daughter was ‘well-secured’ and ‘covered in Christ'” My thing is, was it even necessary? SMH! What is your take on this “baby Bridal Gown”?